This recipe was originally shared with us by Jackie of The Vegan Diet back in 2007. She used broth to keep it light. But if you prefer a more classic pesto, you can omit the broth and add more olive oil until it reaches your desired consistency. Place the pumpkin seeds in a skillet. Dry roast them over low heat, stirring constantly, for 5 minutes or until they are toasted and finish popping. Remove from heat and cool. Transfer the seeds to a blender. Add the parsley, garlic, lemon juice, pepper, and salt. With the blender motor running, slowly add the oil and broth, blending until the sauce is smooth. 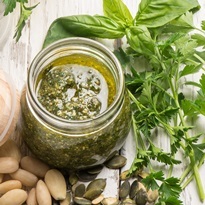 Toss the pesto with hot pasta and serve immediately or transfer it to an airtight ontainer and refrigerate for up to 3 days.